Yanba Dam is a dam project that is under construction in Naganohara, Agatsuma District, Gunma Prefecture, Japan. It is being built on the Agatsuma River, a tributary of the Tone River, which flows down through the metropolis of Tokyo, and the dam project is financed by Tokyo and the five prefectures through which the Tone River courses- Saitama, Chiba, Ibaraki, Tochigi, and Gunma. The project is currently under construction, with completion slated for 2019. Work on the dam was halted in 2009 when the Democratic Party of Japan (DPJ) came to power. It was halted as part of dozens of public works projects to be reconsidered. Planning for the dam began in 1947, and it was planned to be completed by 2015. The dam's construction has seen sustained local opposition and a ballooning budget. Japan has suffered much flood damage, and after World War II dams were planned with the principal intention of protecting the metropolis from floods. Dams have therefore become particularly symbolic because they were favored as a means of flood control and power generation by Japan’s central planners, who have dammed almost every major river in the country. Amid Japan's rapid economic expansion of the 1960s and 1970s, population growth concentrated in cities, municipal water demand grew, and Tokyo and other major urban areas experienced water shortages. Clusters of dams were built upstream of the Tone River as an important facet of city planning, and Yamba Dam was promoted on the back of an emphasis on the necessity of water for domestic and industrial use. 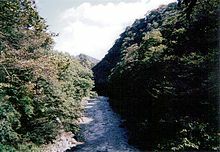 The Agatsuma River, however, has the special characteristic of being fed from acidic rivers flowing down from the Kusatsu hot spring, which was held to make the construction of a concrete dam unfeasible. Planning was halted but then restarted in 1965 after the construction of a plant in Kusatsu to neutralize the acidity of the water. Yamba, which is expected to cost more than 450 billion yen to build, became a national symbol of the big-money projects favored by the old government led by the Liberal Democratic Party. The dam, about 130 kilometers northwest of Tokyo, was designed to help control flooding after a typhoon ravaged the mountainous area. In the years since, it has grown to include power generation and water provision for four different prefectures plus Tokyo. When the project first got under way, local residents waged a strong campaign to save the area. 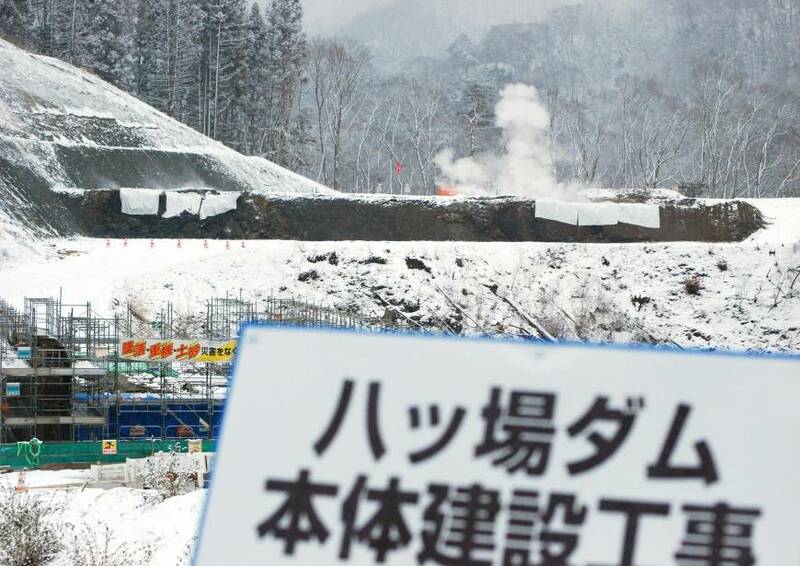 Yamba Dam will submerge the Kawarayu Onsen hot spring which boasts a history reaching back 800 years and residents of the hot spring town fiercely opposed the project and formed a movement to oppose the dam with the residents of farming villages in the surrounding area in 1965. 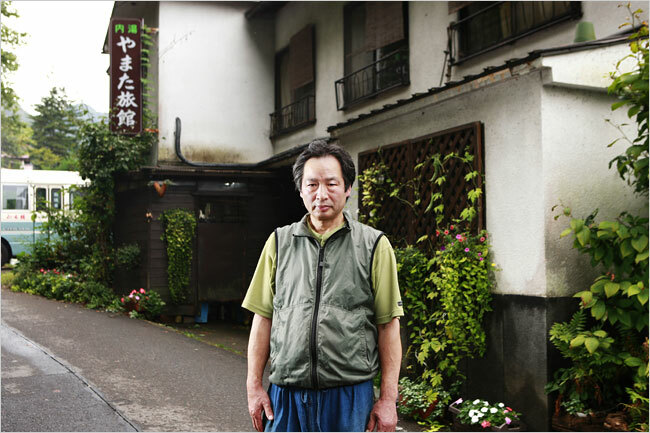 The hotsprings town of Naganohara (6,400 residents) has put the new government on the defensive. Many residents complain that the town’s livelihood now depends on the dam, particularly the compensation payments and construction jobs that accompany it. Some residents blame the dam and its construction for destroying the town’s original economic self-sufficiency by forcing farmers to give up their fields and driving tourists away from the hot springs. As the fight dragged on, most people gave up in resignation, accepting cash payouts for their land or resettlement deals. Some owners of hot spring inns had been hoping to use replacement land provided by the government—lakeside property near the new reservoir—to kick-start the local economy. New houses for those who will be displaced are being built, and family graveyards have been moved to higher ground. Project Details The dam, which would dam the Agatsuma River, would flood an area of 316 hectares, require 422 households to relocate, and affect the lives of 1,100 residents. Why? Explain briefly. The dam construction has been resumed and scheduled to be finished in 2019. Local population will be displaced and incomes and health benefits from hotsprings wiped out. the dam was planned for flood control and water for domestic, agricultural, industrial, and other uses. In line with changing social conditions in recent years, demand for water is trending downward and scientific doubts have been raised about the efficacy of the dam for flood control.